This dress is from the Jenny Packham 2017 collection. This dress is UK size 12. Normally wear UK10 and am 5ft 7. 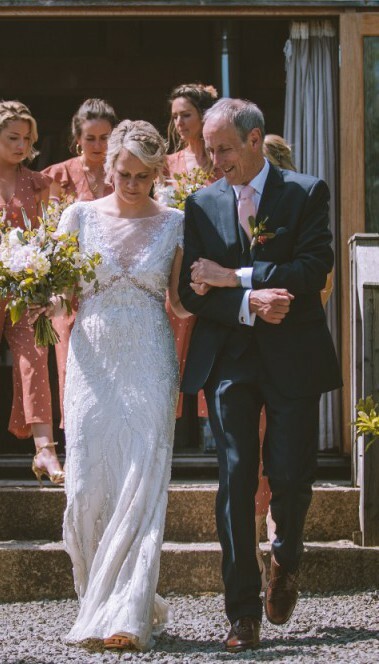 The dress was originally taken up by the seamstress in the Jenny Packham store and I wore 3 and a half inch heels on my wedding day. The dress still has the label, Jenny Packham dress hanger and dress bag. This is one of the most beautiful dresses I have ever seen. It is elegant, comfortable and easy to wear! The hand stitching and embellishment is wonderful and I received so many compliments about the dress on the big day. The Jenny Packham seamstress has added a bustle to allow the train the be held up so you can dance the night away. I loved this dress from the very first moment I saw it. I am selling it because q dress like this should not be kept in a box - I want someone else to have this and feel as amazing as I did. If you live locally to St Agnes, Truro area(TR5) - you are welcome to come and try the dress on. The dress is in an excellent condition and has been professionally cleaned. There is small mark on the bottom left side of the dress - which cannot be see when it is worn. A small tear on the train has been repaired. The top button elastic is slightly pulled but does not affect the dress in any way.